Wish you all a Very happy New Year 2006. Sai Ram Natrajan Bhai and Happy New Year to you too! Long time no showing. Are you OK? How about THAT thing? Long time not to be seen. HAPPY NEW YEAR to you, too, dear Natarajan! I'm happy whenever I read of you. And you know, sometimes BABA saves the best for last. So maybe HE wants to give you many more of HIS choicest blessings before HE gives you THAT [ ][ ][:X][ ][ ]. May this New Year fill your life with Baba love and care. Thank you very much Ramesh Ji, Subha Ji, Astrid Ji, Praveen Ji and every one here. Soon there is a good news you can expect me to put here, if it is bad also I will let you know. Whenever I enter here, I want to write more .. but just words cannot express what I want to say. 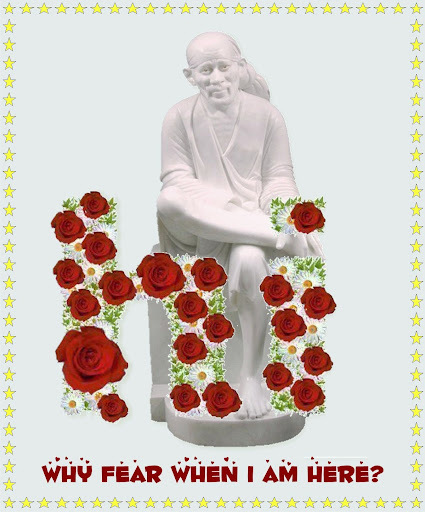 Sai will always guide and He is always with you. Nice to see your mail. Thanks a lot Subha Ji. Yesterday I have shifted my house to BTM layout where Baba's temple is there which I go regularly and my house is just 15 mins walk from the temple . Evening I went to Baba temple... Surprise... always I wanted to own a Big baba's picture, but I never got a chance for that... But yesterday that wish has been fulfilled ... now in my new house there is a new big baba's photo too. May you always feel blessed like this. ON A THURSDAY MORNING IT IS VERY GOOD TO READ YOUR MAIL. IF I AM RIGHT NOW YOU MUST BA BACK TO BLORE.IF SO!AWESOME. Thanks a lot Astrid Ji, Subha Ji and everyone here !!. Thats great to read your posts and feel how affectionate you are... I am very much lucky to get this. Astrid Ji, thanks for your beautifull words which makes me feel more blessed. Subha Ji, glad to your post ... Yes I am in Banglore only. But I am here in Bangalore for past 2 years ... Cant get your question clearly. Dear I was discussing about you only with Shammi ji that you are missing. I tried your cell but unable to reach you. Well hope you are fine and doing good. I just thought you were in Mumbai(Bombay)for training with regard to your new work.I am so sorry to have confused you. HAPPY Makara Sankranti to you. I am doing good with Baba's blessings, Subha Ji, they have provided training in Bangalore itself .. Ravi Ji, I have changed my mobile number and I think Shammi Ji has it .. anyways ..this is my new number - 9886637881. Looking forward to talk to you. Page created in 0.26 seconds with 69 queries.